What if we introduced more beauty to our life stories? Entering the exhibition feels like diving into a secret magic space. 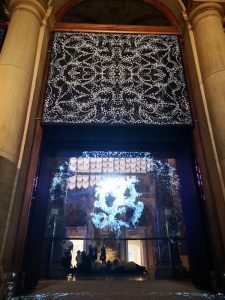 Tiny drops of water, forming a transparent “fog screen” are stroking my skin when I cross the space between the profanum of the streets of wintery Vienna and sacrum of the Museum für Angewandte Kunst (MAK) in Vienna. The ornamental “B” displayed on the drops stands for „beauty“ and takes me back to a beautiful memory when my mom gave me a bracelet, inherited from her own mom. The beauty of this memory is as precious as this piece of jewelry and makes me reflect on the significance of beauty before I enter the display. And indeed, for much of the past 2000 years, beauty has been equated with goodness. Plato considered beauty a moral value saying: “Whatever is good is beautiful, whatever is beautiful is good”. The Greek word “KALÓN” still stands for everything that pleases not only our sight, sound, and smell but also initiates admiration in the soul. “True beauty comes from within”. 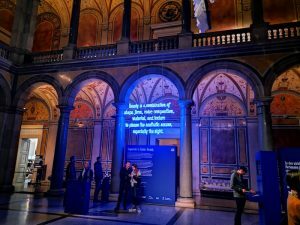 With their exhibition, Stefan Sagmeister and Jessica Walsh try to prove that beauty is not only a surface strategy but a central part of what it means to be human. 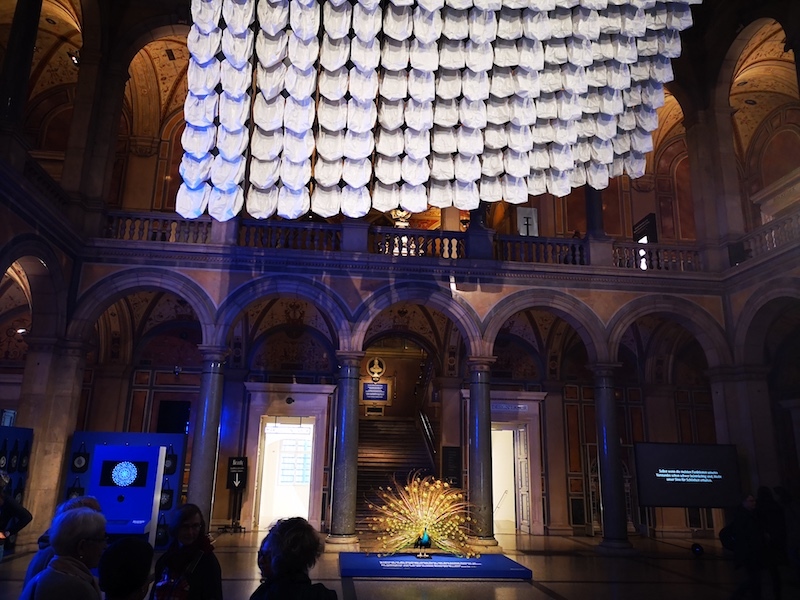 I am thrilled when I see a spectacular installation in the Main Hall – a cloud below the ceiling made out of huge bags filled with air, changing their volume to the song by Siskiyou. It invites to me lay down on the huge pillows spread on the floor below it and slow down. At the same time, it reminds me of the value of clearing up the mind before contemplating beauty. Beauty has never been something absolute and unchangeable. It had and still has different faces – depending on time and culture. People at different times created different beauty ideals and followed different aesthetic needs. It was the 19thcentury that took quotes from the past and established the multi-perspective canon of beauty. All the “neo-styles”, such as “Neo-classic”, “Neo-romanic”, “Neo-gothic”, “Neo-renaissance”, “Neo-baroque”, and “Neo-rococo” flourished all over Europe, allowing different ornaments and decorations co-exist in one urban space. Until Adolf Loos published his essay entitled “Ornament and Crime”, where he despised “stealing” from the past and described the use of ornaments as a real crime. It is somehow peculiar that three architects – apart from Loos in Austria, Le Corbusier and Mies van der Rohe managed to convince everyone in the 1930s that the modern architecture has to be functional and not decorative. The same trend we can notice in literature. In the installation entitled “How often is “beauty” mentioned in books over time?” we can see the decline in the 1940s, 1960s, and 1980s. This “less is more” attitude created an empty space in our aesthetic spaces. Human beings need beauty as much as they need air to breathe. What is our current definition of the “neo-beauty” nowadays? Many installations in the exhibition try to offer various answers or simply inspire to pose questions and to experiment… As a visitor, you are encouraged to participate in the display in a very interactive way. Not only voting by giving your answers to the following questions “Which of the landscapes do you find the most beautiful?”, “Which of these smells do you think is the most beautiful?” but also interacting in the digital spaces makes you the co-creator of the Beauty exhibition. Is the “new beauty” a co-creation process? Even though there are different beauty ideals in different cultures, there is one universal human sense for beauty that remains in every single human being despite changes in the outside and inner world. Dr. Helmut Leder from the research unit on visual aesthetics in Vienna proved it while conducting a study on a large number of patients suffering from severe Alzheimer’s disease. He showed them six pictures and asked them to organize them in a raw from the most beautiful one to the least beautiful. Two weeks later he visited them again and repeated his experiment. All patients, including those who would not even recognize their own children, arranged the pictures in the exact same order again. In the times of permanent changes and disruption is not it comforting that our sense of beauty remains the same until the end of our life? Beauty is so important to us not only because it is able to enchant us, to make us dream, and inspire us, but also as it can heal our wounds. One of the most impressive examples in the exhibition is the initiative by the US-American tattoo artist David Allen who develops designs to help women recovering from a mastectomy after breast cancer. The trend to integrate beauty into the healing process has risen within the last months. “Access to the arts and social activities improves people’s mental and physical health“, says UK’s Health Secretary, Matt Hancock who recently started an initiative „to prescribe therapeutic art- or hobby-based treatments for ailments ranging from dementia to psychosis, lung conditions and mental health issues,” Smithsonian. A similar campaign was launched in Canada, where doctors at the Montreal-based medical association, convinced of the positive influence of art on well-being, prescribed their patients visits to the Museum of Fine Arts. Have we finally noticed how much we need beauty in everyday lives? Leaving the exhibition through the fog screen again makes me recall the sensation of the tiny drops on my skin while entering two hours ago. It feels like κάθαρσις (Greek catharsis) – the “cleansing” by water and by the numerous aesthetic impressions. I feel gratitude in a double sense. First of all, because I had the chance to contemplate beauty and get inspired by the exhibition and second of all, because I could enjoy it in a wonderful company of my precious friend, Saskia. The shared experience of beauty multiplies it as much as shared happiness multiplies happiness. 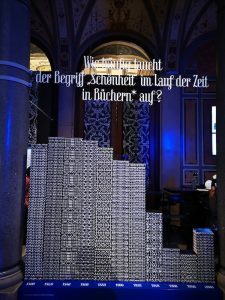 Sagmeister & Walsh (2018): Beauty, leaflet of the exhibition opened at MAK in Vienna from October 24th2018 to March, 31st2019.